With a predicted 50 million outbound travellers by 2020, India is one of the world’s fastest growing travel markets and the target of an innovative new digital marketing campaign by Destination NSW that showcases the best of Sydney and NSW to Indian visitors. The landmark campaign, called ‘Jhappi Time’ or ‘hug time’, is the first campaign developed and executed by any Australian tourism body, to specifically target the visiting friends and relatives market, in India. The campaign features four ‘Bollywood-style’ vignettes directed by Bollywood director and Head of Films and TV for the Australian India Film Fund, Mr Anupam Sharma, set in various popular tourist locations around NSW including Sydney, Manly Beach and the Blue Mountains. 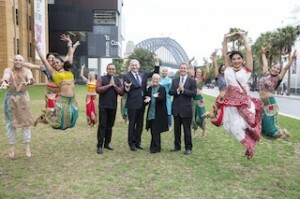 A cast of local Indian dancers, actors and musicians feature in the campaign. Destination NSW CEO, Sandra Chipchase, described the campaign as a creative and industry first that will ensure Indian travellers will have NSW front of mind when they plan their Australian holiday. “Destination NSW has worked with leading Bollywood film director and Australian filmmaker, Anupam Sharma, to create a fun, completely unique and culturally authentic campaign that will appeal directly to Indian travellers’ love of family, fun and good times,” Ms Chipchase explained. “More than one third of Indian visitors come to New South Wales to spend time with their loved ones, so we are tapping into the enormous potential of the ‘Visiting Friends & Relatives’ market segment in NSW. In launching the campaign earlier today, NSW Premier Barry O’Farrell said the campaign aims to build on the State’s reputation as the key destination for Indian travellers to Australia. “Sydney is the number one Australian destination for Indian travellers, with Regional NSW growing in popularity among tourists from India,” he said. In the year ending September 2013, NSW received 77,664 visitors from India who spent 3.6 million nights in the State. Told against the backdrop of famous landmarks in Sydney and around NSW, the ‘Jhappi Time’ vignettes feature actors and leaders of the Indian community in NSW including Mala Mehta OAM, Head of GOPIO Lucky Singh, Founder of TiE Dilip Rao and two finalists of Australia’s first Bollywood reality show, SBS’s Bollywood Star. The four vignettes include the stories of: Sikh parents wanting to visit their daughter who is studying at the University of Sydney; a husband and wife missing their adult children who all live in Sydney; a woman who is becoming a grandmother for the first time and wants to visit her new grandchild in Sydney; and a young woman who wants to visit her best friend who lives in Sydney. The vignettes will be shown in India through digital media as well as through cinema advertising, where they were tested across different demographics, and will support in- market industry partners and travel wholesalers to promote travel packages and airfare offers to Indian travel agents and visitors. The vignettes are supported in Australia through an online marketing campaign including shareable postcards featuring some of NSW’s tourism hot spots, as well as on Destination NSW’s sydney.com and in.sydney.com websites and its social media platforms. Last month Sydney’s Facebook and Google+ pages both reached one million followers, a first for any Australian city. The campaign will launch online in India from today.